Luxurious Discovery and Fantastic Location! Lower Deer Valley…an easy stroll to Snow Park Lodge. The free shuttle takes skiers to the lifts and is about 20 convenient steps from the patio. Easy access and easy to find. Centrally located to Main Street, Park City Resort, the Canyons, and of course Deer Valley. The condo has been recently renovated - hardwood floors refinished this year and rain showers in each bathroom. We LOVE our unit! Spacious, warm, clean, and well appointed. Two bedrooms, two baths, about 1300 square feet. An exceptional space with all the bells and whistles…fully equipped stainless kitchen, 10 foot ceilings, granite countertops, slate & granite baths, hardwood floors throughout, WIFI, bedrooms with new LCD TVs. Serta beds, garden tub in Master & our spacious great room has a wall mounted LCD TV. It's great for a family; sleeps eight: Master bedroom with a king, Guest bedroom with a queen, Living Room has a sleeper sofa with an upgraded spring mattress with built in air mattress. There is an additional daybed trundle in the Master that makes out to two twin beds. We have a private 6 person Jacuzzi right on the patio. Oh, and by the way.....no stairs to hassle you with ski equipment. Sweet! Carol: I am an Interior Design Sports Marketing professional who purchased this place just after the Salt Lake Games. I worked in Salt Lake for the two years leading up to the Games and fell in love with Park City and Deer Valley. I try and spend as much time as possible in Deer Valley in the summer, to escape the heat in Atlanta, my primary residence. Vicki: I am Carol's sister and live in Atlanta, too - Carol introduced me to Park City shortly after the condo was purchased. I've been a frequent visitor to our mountain home through the years - love skiing Deer Valley Ski Resort, and Park City is a fantastic summer and fall getaway, too. There's nothing like the gold of the aspens in the fall. I handle all of the bookings for the condo and work hard to insure all of our guests enjoy our condo and the Deer Valley/Park City area. Our place is just at the base of Deer Valley directly across from Snow Park Lodge. We have beautiful views of the mountains and ski runs. The ski shuttle runs a few steps outside the patio. No one wants to hassle with stairs, so our condo is on the ground floor....but with 10 foot ceilings, so the entire unit has a wonderful, open feel. We are both very particular, and this unit met all of our expectations. The ski shuttle runs right outside the door. We have a quiet end unit, and just outside the patio is a great 5 foot wide side walk for biking, walking, etc. Concierge service is available that helps our guests with ski rental, grocery store, or daily housekeeping - just let us know if you are interested. The Park City tram will take guests to all major ski resorts, as well as Main street in Park City, less than 2 miles away. Oh, and there is a private hot tub right on the patio AND he unit has been completely remodeled with all new hardwood floors. 2 bathrooms, each with a rain shower. The jacuzzi tub in the master bathroom is currently turned off. Beautiful views of Ski Runs at Snow Park Lodge - enjoy while relaxing the hot tub! Linens for 2 twins, 2 queens, and 1 king. Stackable Washer and Dryer (brand new). 1 Car Garage and plenty of available parking behind the condo. The wine cellar to the right of the refrigerator is currently inoperable. HBO, Showtime & Starz included with Cable Package, DVR . (3) 42" Wall Mounted LCD in Great Room - LCD's in all other bedrooms. (2) located in master and living room. Easy access to all Deer Valley and Park City ski resorts. Not available in summer - drained and disconnected. Concierge Service: Grocery Shopping, Baby Furniture Rental, Lift Tickets, Snow mobiling. No land line telephone. The property was nicely appointed and was very close to the mountain. We truly enjoyed our stay. What a perfect place to enjoy Sundance! The location of this condo is amazing! So close to Main Street and the bus takes you everywhere you need to go. No need to rent a car at this condo. Skiing is a short walk or bus ride away. Relax in the hot tub and in front of the fire. This condo checked all of the boxes for an amazing vacation in Park City. This was our second Christmas trip to Deer Valley but our first in this condo. I have to say, it is perfectly situated close to everything. You can walk right to the St. Regis or Snow Park Lodge or you can head the other direction and walk right to the Deer Valley Grocery. Convenient bus stops right outside the complex also make this a great location. The unit was clean and well appointed. After spending all day in the cold, it was great to be able to take a nice soak in the hot tub as well! Owners were very responsive during the reservation process and the lead up to our arrival. After our stay ended, the owner also asked for feedback on the unit to ensure that they met the needs of their guest. Overall, I would definitely rent this unit again for our next trip to PC! my family and I really enjoyed staying here. 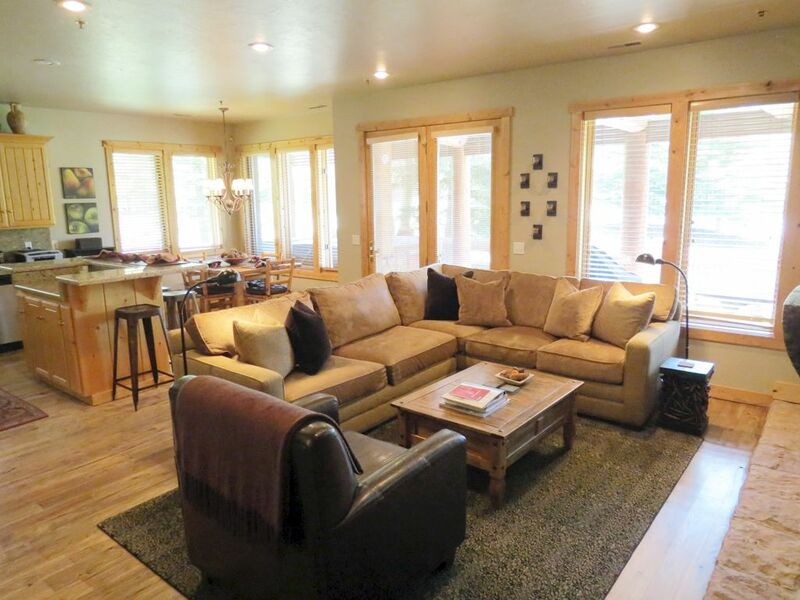 The unit was comfortable and cozy and very conveniently located to the Deer Valley mountain. It was a tiny bit on the dark side, but we enjoyed having the private Jacuzzi, fireplace, laundry and it was nice to be on the first floor because our kids could easily go out and play in the snow and we could see them from inside. Thank you very much for your kind review! Please note the living area and kitchen have windows all around for plenty of natural light, and we are planning to add additional lighting in our bedrooms. We really enjoyed our recent stay at Chapparal - the kitchen, bedrooms, and family room were well-appointed, and we loved the hot tub with views of the mountain. For our family, we would have preferred a second stand-up shower over the jetted tub in the master bathroom, but overall, the bathrooms were very nice. Would also note that the garages in the complex are very tight (particularly for this end unit), so best to avoid SUVs or mini-vans if you are renting a car. Thank you very much for your kind review - we sincerely appreciate it! Please note there is a shower head in the master bath tub for those who prefer showers, and there is parking for an SUV or minivan directly behind the enclosed garage - our family typically rents large vehicles whenever we stay at our condo. Wonderful Christmas vacation in Park City!! Our family of four spent an amazing Christmas vacation in Park City! Carol and Vicki offered the most comfortable surroundings in their rental unit. The unit was spacious and clean with pristine furnishings. The location was perfect for all Park City had to offer. We spent days skiing at Deer Valley, which was conveniently one shuttle stop (a mere few minutes) from the unit. In the evenings, we would either cook our own meals in the well equipped kitchen or visit the many amazing restaurants on Main Street. We enjoyed the hot tub in the evenings too. Grocery stores and other conveniences were roughly two miles away. Though the Park City Shuttle is more than ample, we did rent a car as we had two small children. This was our preference but the unit is so well located, a car is not necessary. Carol and Vicki were easy to work with and always timely with their communication. We are looking forward to planning another trip to Park City and staying here!! Very close to Main Street at Park City - lots of excellent restaurants and shopping there. The shuttle stop for the Park City Tram is located directly behind the unit. Deer Valley, the Canyons and Park City Ski Resort are also nearby and accessible via the free shuttle. Cancellation policies differ for Holidays, Sundance, and Presidents Week. Please ask Owner if booking during these periods.